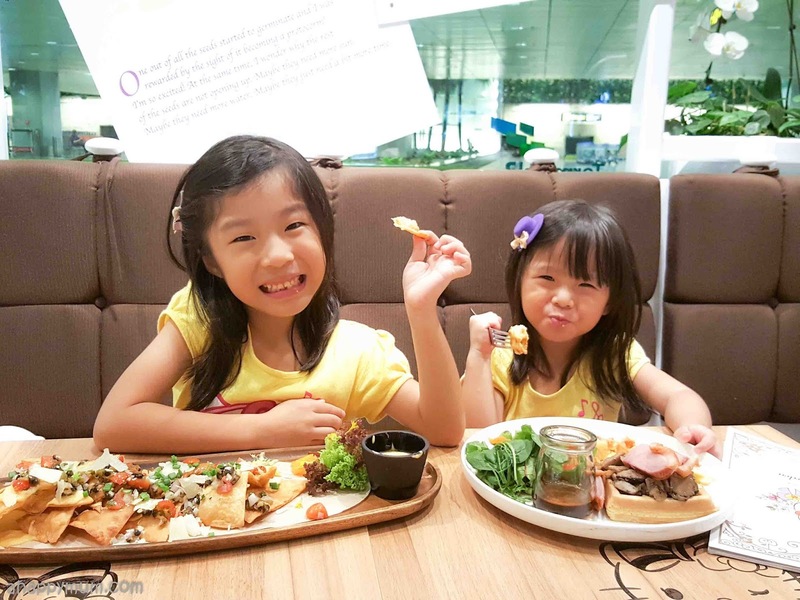 Changi Airport has always been one of our favourite hangouts - you get a variety of dining options, take the skytrain, play at the playgrounds, watch planes, be amazed by the Kinetic Rain, go on slides, doodle and draw, have fun in the arcade, chill out at cafes and more. 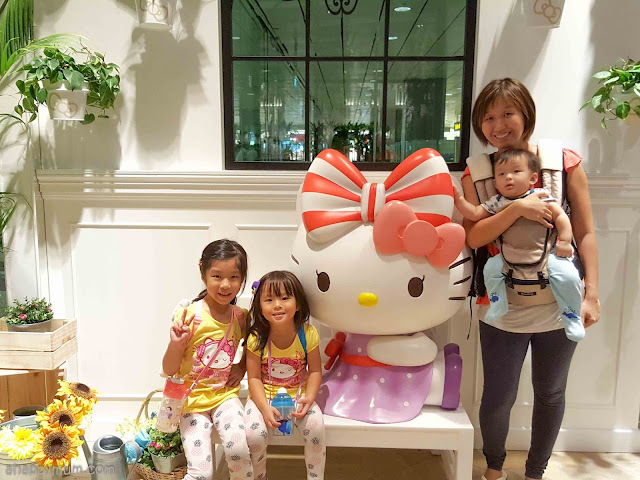 Since it was the Youth day holiday two weeks ago, I was feeling ambitious and decided to ditch the pram so that the kids and I could take the bus to Changi Airport to have a mother-and-kids outing. 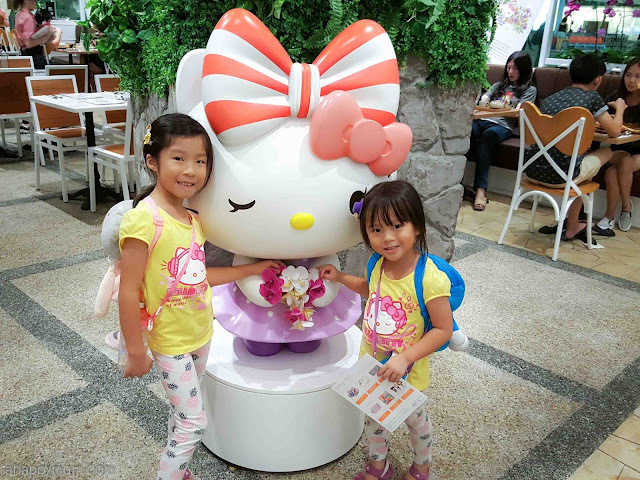 On our way there, a friend suggested "Why don't you go check out if the Hello Kitty cafe is crowded?" 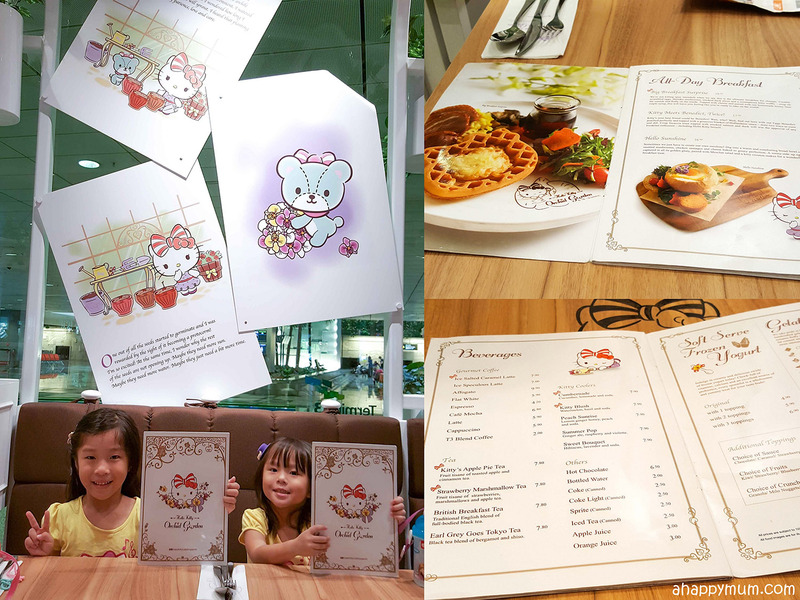 That was why it dawned on me that there is now a Hello Kitty theme cafe in Terminal 3 which just opened in May this year. Yes, I'm not very up to date on such theme cafes and I'm totally not cut out to be a food blogger. 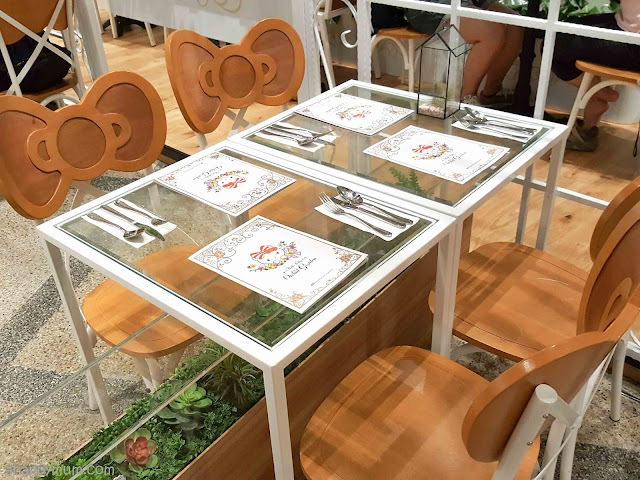 But, it turned out that we had a very pleasant experience so here's sharing all about this new theme cafe which opens 24 hours! Yes, you read right, that means you can visit at any time of the day or night. In line with a garden city theme, Hello Kitty Orchid Garden sits in an elegant glasshouse setting surrounded by lush greenery and opulent orchids. 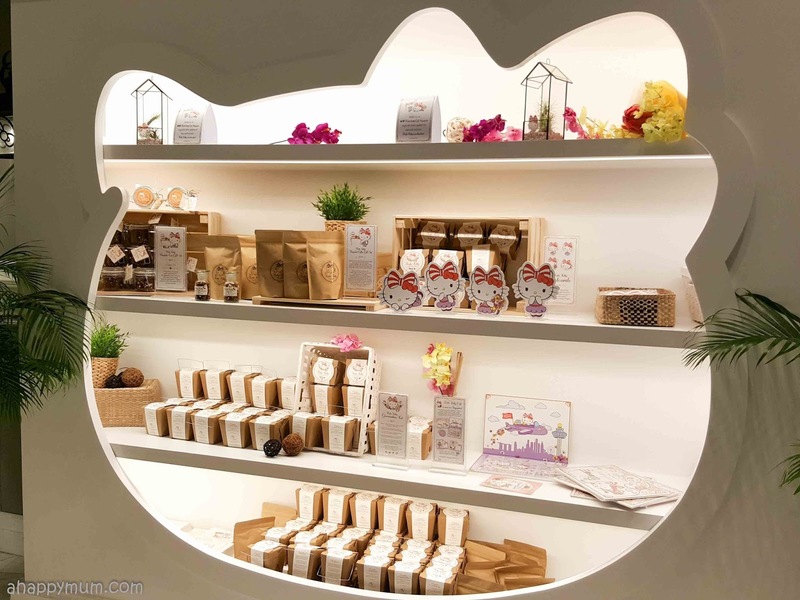 I initially thought that the café, being a theme one, would be plastered with pictures and figurines of the feline. 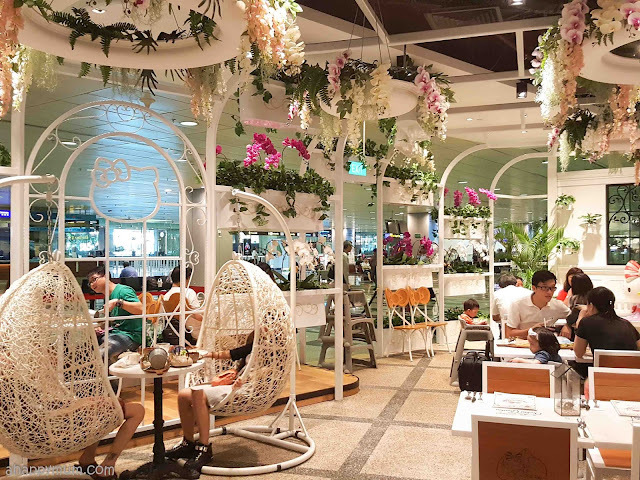 So, it was a nice surprise when I stepped in and realised that the place was more sophisticated than expected and instead of entering a cartoonish, kawaii or princessy fairyland, we walked into an enchanting floral paradise. 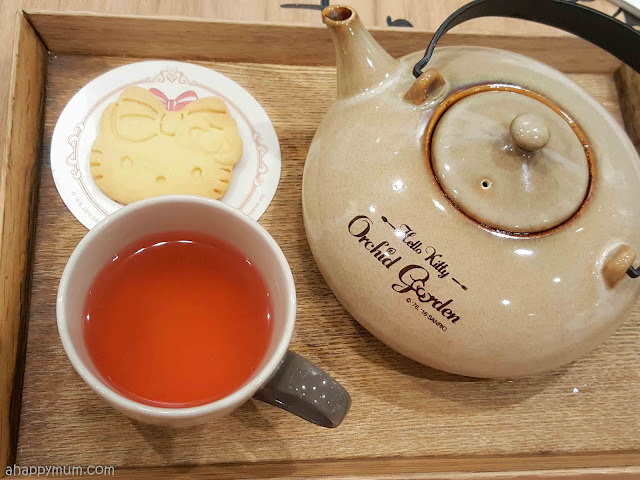 Once you step into the café, you can shop for some exclusive Hello Kitty merchandise - including coffee and tea gift sets, postcards and even a germination kit which you can try to grow tomatoes, eggplants and cucumbers. How interesting, right? The Hello Kitty mascot that greets you at the entrance is dressed in a sweet lilac dress, holds a bouquet of orchids and dons not one, but two bows. While it may seem redundant. it is said that this is the only Hello Kitty in the world that has two bows. So, what are we waiting for? Must take picture for sure! The interior design, while keeping to the Hello Kitty theme, is chic, subtle but not over the top. You can find a porch seating, a pair of wrought iron swing seats, wooden chairs with bow backing and logos on the table. The kids were hoping to sit on the swing seats but alas these were occupied - you have to be very lucky and be there at the right timing. Anyway, I was more than thankful to see that there were ample empty seats when we arrived just before 6pm. I simply can't imagine, and won't, queue up for hours just for this. 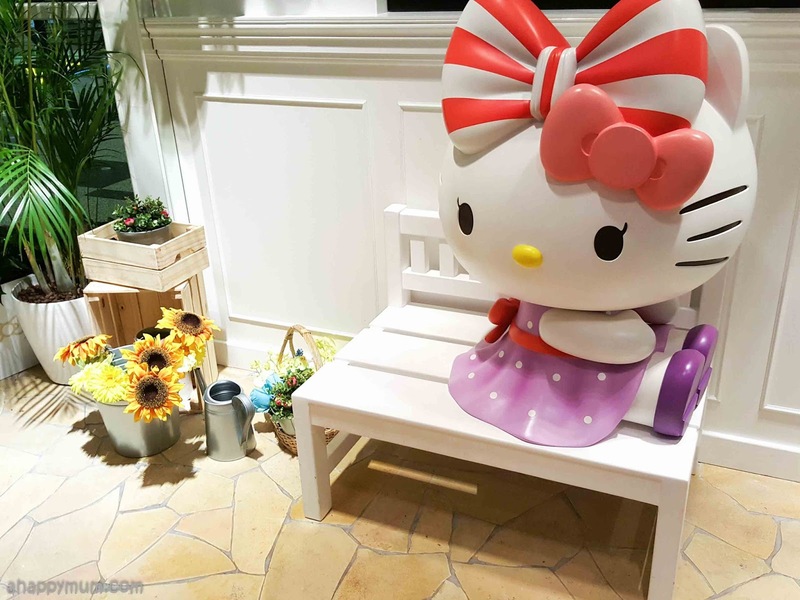 For the Hello Kitty fans, there is also a picturesque photo spot for you to take a shot with the sweet-looking feline seated on the bench with a pot of cheery sunflowers alongside. If you are wondering, there are only two mascots in the café - one at the front, the other at the back - and you won't miss them. Moving onto the menu, since the café is open round the clock, it covers the different meals of the day - including all-day breakfast dish, soups, salads, sandwiches, sides, rice, pasta and desserts. To make it uniquely Singapore, a handful of local flavours have been incorporated into the menu, for example the Cowabunga Wagyu ($24.00) - a rendition of beef rendang stew served with Japanese rice. 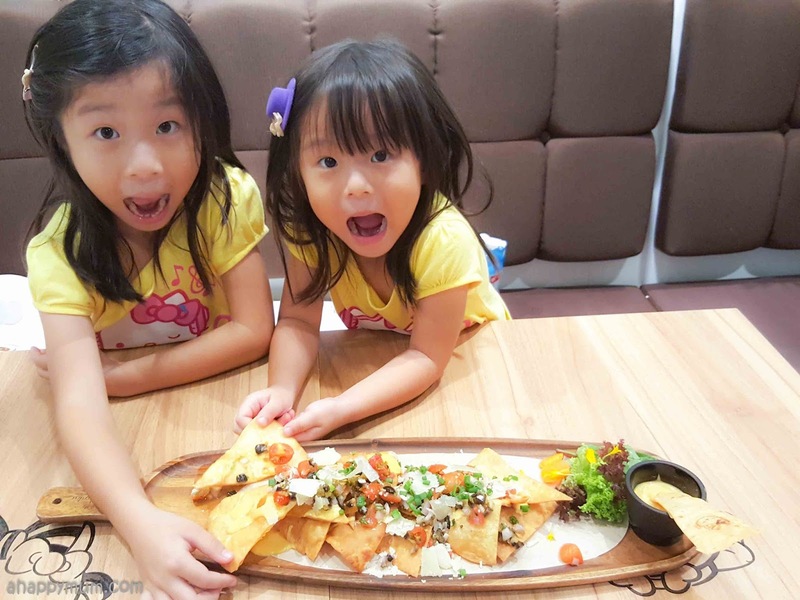 The girls are fans of nachos so it was natural that our first choice of dish was the Hola Nachos ($15.90) - tortilla chips topped with parmesan, jalapenos, olives, onions and cherry tomato salsa and comes with a cheese sauce dip. Alas, both of them found it to be a little spicy (because of the onion taste) and while Ariel decided to skip it entirely, Angel was contented to scrap off the toppings and just dip the naked chip into the sauce. Yes, we might have well just go to the movies and ordered some nachos instead. The consolation was I actually enjoyed it and even though the sauce was cold, the whole combination had a refreshing, tangy taste that made it palatable and to my liking. Next, we tried out the Big Breakfast Surprise ($18.50) - a platter of creamy scrambled eggs, shiitake mushrooms, smoked duck slices, waffles and homemade honey lime maple syrup. 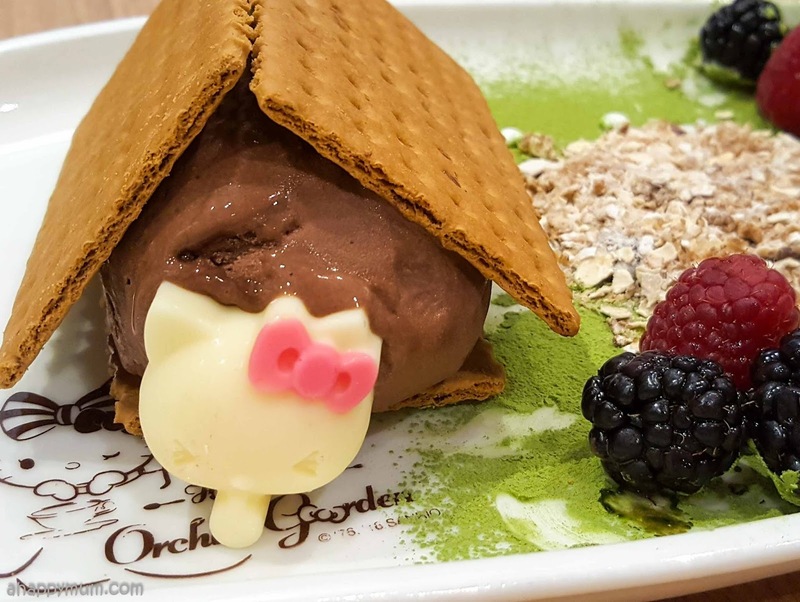 We were pleasantly surprised to see a Hello Kitty shaped waffle and even more delighted to discover that it was actually.... crispy! 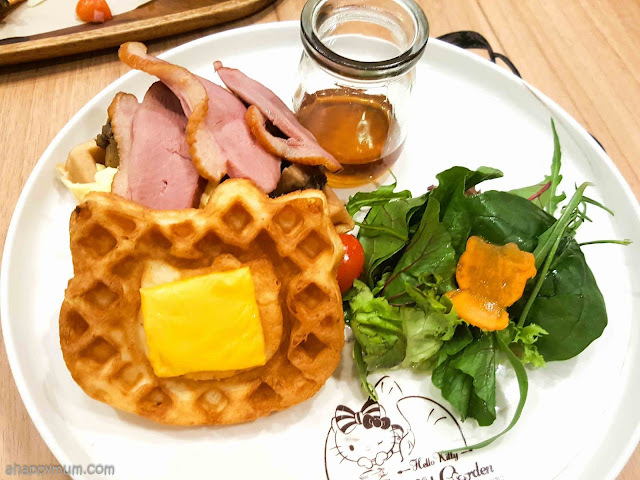 Yes, the little girl literally gobbled it up within minutes and if one waffle is not enough, you actually have another soft, fluffy waffle underneath the duck and mushrooms. The big girl loved the smoked duck slices and thought they were ham, whereas I liked the bursting flavours of the shiitake and the innovative but not too overpowering honey lime syrup. I'm not really a coffee person so I thought I would try out the tea. The Strawberry Marshmallow Tea ($7.80) - a fruit tisane of strawberries, marshmallows and apple tea - was a tad too exotic for my taste buds and I wished I had tried one of the Kitty Coolers (Cumbernade ($7.90) - cucumber, lemonade and soda or Peach Sunrise ($7.90) - lemon ginger honey, peach and soda) instead. At this point, the kids were asking for ice cream and had started surrounding themselves with their bags and the menus, pretending to be camping. It was then I decided that we were fated to try out this signature sundae called Camping Under the Stars ($19.50). Can you see the creativity in there? Graham crackers stacked on chocolate and hazelnut gelato for the 'tent', matcha powder for the 'grass' and toasted muesli for the 'campfire'. How cool, right? It was a slight bummer for me to see that the ice cream was already starting to melt when the plate was served, though it didn't seem to bother the girls in the least. They were thrilled to find, and gobble up, the Hello Kitty white chocolate while I was happy to finish up the berries. 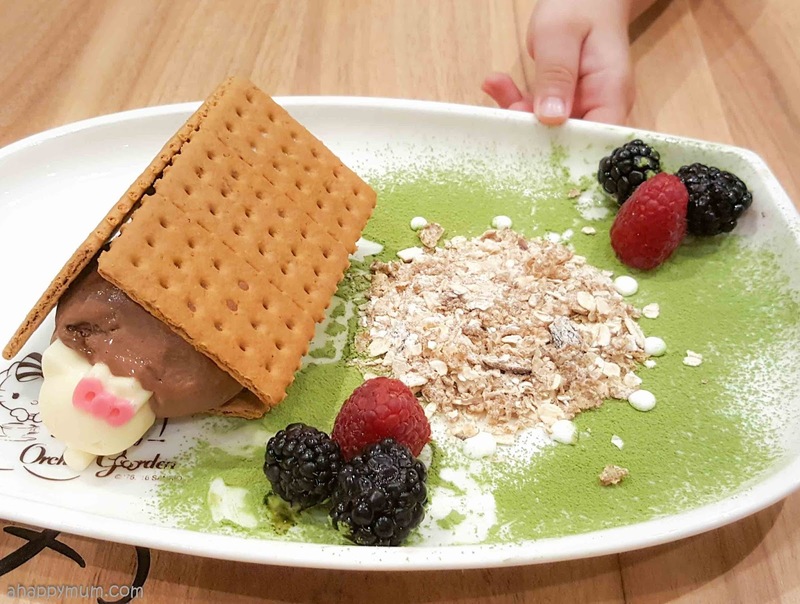 Overall, I love how the different flavours and textures come together and would definitely recommend this as a dessert. 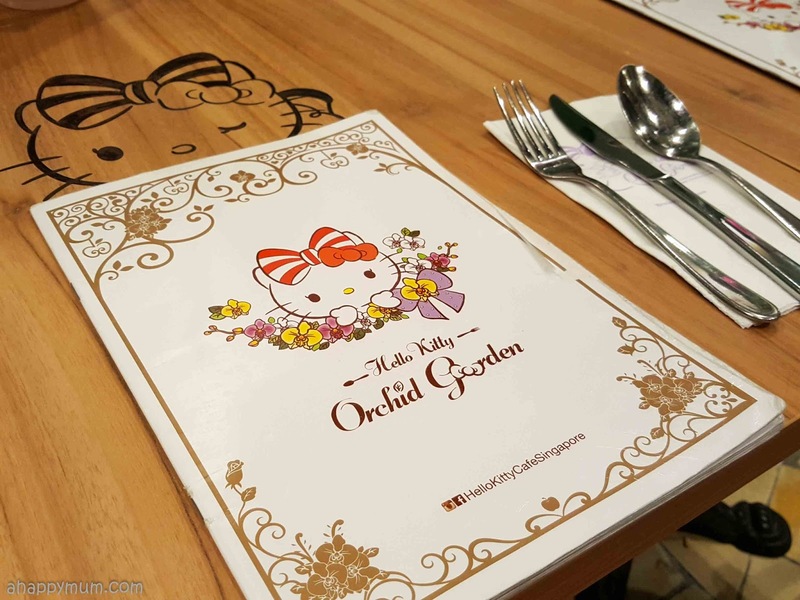 We've heard how the food can be quite terrible in some theme cafes, but it ended up that we were totally satisfied with our experience at Hello Kitty Orchid Garden. Okay, to be frank, we are not food connoisseurs and usually don't have high expectations when it comes to eating. Will we come back here again? I would say yes, especially if we are in the airport and need a snack break, provided that the queue is not too long. That said, it will probably have to take quite a while since we need to save up as the food here isn't exactly cheap. Well, I'm just glad that the kids and I had a fun-filled outing and left the place with fond memories on our first visit. P.S. Did you realise that the girls are wearing Hello Kitty shirts? It was totally unplanned as we only decided to come here after we left the house. Talk about fate! 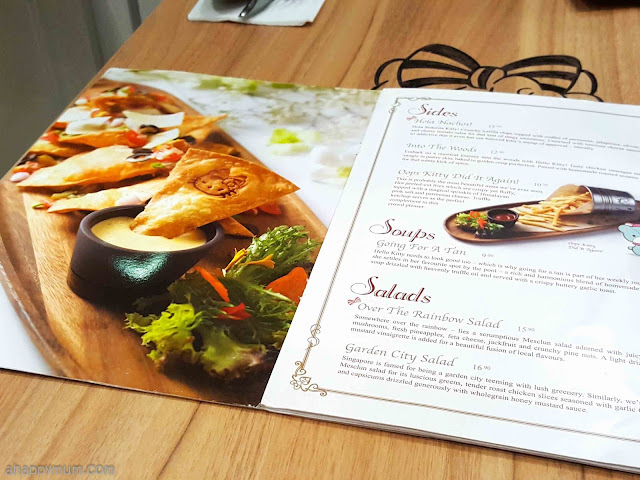 Note: A limited menu is offered between 12 midnight to 6am daily. Click here for menu highlights. Disclosure: This is not a sponsored post. 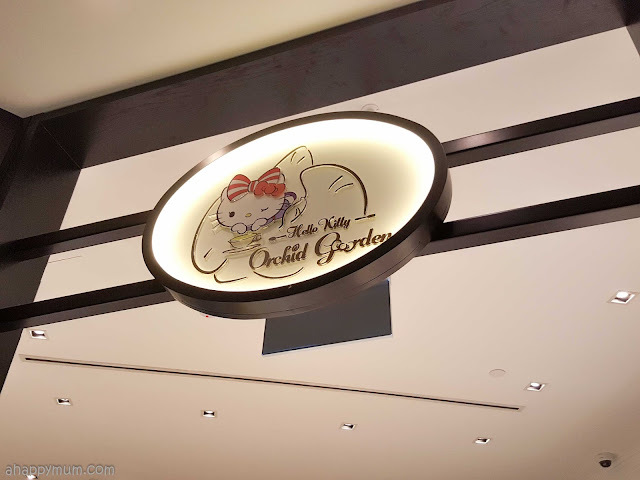 We visited Hello Kitty Orchid Garden out of our own accord and paid for everything from our pockets. I used to be feeling bold and decided to ditch the pram in order that the children.I to begin with thought that the café, being a subject one, could be plastered with pics and figurines of the feline. I'm working at Out of Home Advertising in Thiruvananthapuram So, it become a pleasing surprise once I stepped in and realized that the vicinity become more state-of-the-art than anticipated and instead of coming into a cartoonist.